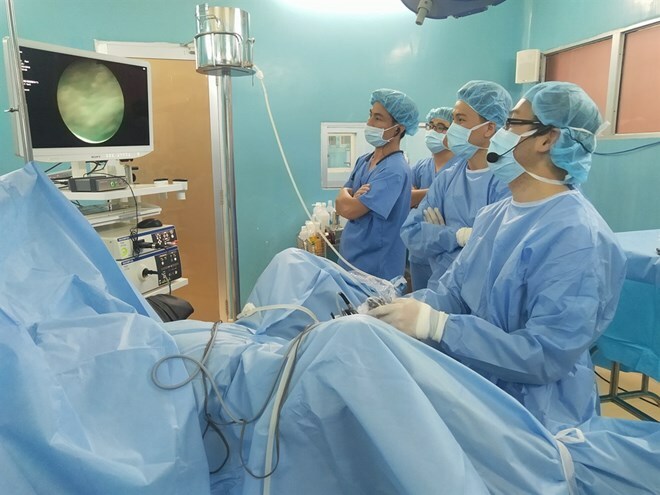 HCM City (VNA) - More than 1,000 new cases of urinary bladder cancer are diagnosed in Vietnam every year, according to HCM City’s Binh Dan Hospital. Assoc Prof Dr Nguyen Phuc Cam Hoang, the hospital’s deputy director, said that around half of the patients die due to the disease. On March 5, a 69-old-year man from the city’s district 3 was brought to the hospital after having had blood in his urine and intermittent abdominal pains two weeks. Doctors found he had three tumors in the bladder. They then decided to use en bloc resection technique to remove the tumor in one piece as an alternative to traditional techniques to help reduce the chances of recurrence. Hoang said the hospital last year admitted 1,873 bladder cancer patients, many in advanced stages with a high risk of having the whole bladder removed and severe health problems. The cancer does not have any specific symptoms and are the same as infections in the bladder or kidney or kidney stones: blood in urine, Hoang said. Patients with bladder cancer are often between 50 and 60. But Hoang said the hospital also admits many people aged 30-40.